The Tunnel is a franco-british series aired on Sky Atlantic and Canal Plus since 2013. The show is currently in its second season. A year has passed since the collaboration between Elise and Karl Wassermann Roebuck in the case of the “Terrorist of Truth.” The french woman was promoted while the british took a step back following the death of his eldest son, Adam. But the duo is reformed when a couple of scientists is kidnaped under the eyes of their daughter. 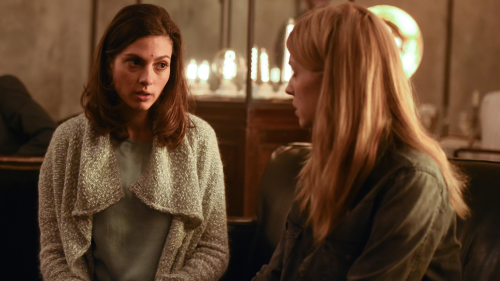 Elise and Eryka (the assistant of Paul Bresson) are portrayed by Clémence Poésy and Laura de Boer. NB: the video clip is french dubbed for now (no subtitles). Their love story start in the season 2! Ah mais seulement en français? So did this video (that’s disappeared) depict the entire ‘relationship’, or just part of it? The clip is ten minutes long and it depict almost all their story. It doesn’t cover all their scenes, though. Omg is there going to be a season 3?